Insulin resistance is the dominant theory about the cause of Type 2 diabetes. According to this theory, for some reason, the body’s cells become “insensitive” and do not respond to the insulin hormone. This causes glucose to remain in the bloodstream rather than entering cells even when there are adequate levels of insulin in the blood. Why does this happen? Oddly enough, medical science has not yet been able to explain why this supposed insulin resistance occurs, nor by exactly what biological mechanism it happens. It remains unexplained why billions of cells suddenly switch to resist the presence of insulin to allow glucose to enter them when those cells didn’t have the problem before. No matter how much biological science you know or don’t know, it is clear this theory does not make sense. Some researchers, medical practitioners, and diabetes educators, finding it difficult to let go of a theory they have been working with for a long time, demand experimental proof for the absence of insulin resistance, instead of their own asking for or providing proof of its existence. In addition, the ability to measure the degree of resistance is lacking, though this can lead to targeted therapy based on the site and degree of resistance. 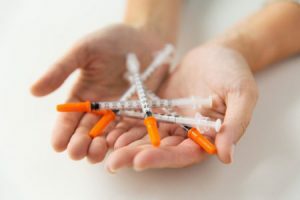 Currently, practitioners prescribe the same medication, insulin, to which the patient is supposedly resistant, to force muscles to accept more glucose and the liver to release less, without any way to measure any reduction in insulin resistance in any of the sites. Contrast this illogic with the common medical practice of doctors halting the use of an antibiotic or chemo agent when a patient develops resistance to it. Some researchers have sought to provide an explanation for the development of insulin resistance by correlating it with the intake of foods containing high fructose corn syrup. This ignores the more obvious elephant in the room -enormous amounts of glucose molecules absorbed from grain-based carbohydrate by the same individual. Still others talk about insulin resistance caused by environmental agents entering the body and/or imbalance in intestinal organisms, yet they cannot explain how high blood sugar can become reversed after weight loss following delivery in a pregnant diabetic or after bariatric surgery in an obese diabetic. The only logical conclusion: insulin resistance is incorrect. To date, there is absolutely no proof that insulin resistance accurately explains why the body’s cells do not intake glucose the way they normally do. Furthermore, we have no information on the reason why or the mechanism by which cells suddenly become resistant. Nor do we have a test to measure the degree of insulin resistance among any of these cells, which could facilitate the development of targeted treatment of diabetes specific to the site and severity of resistance. ** This blog is an excerpt from my book, Diabetes: The Real Cause and The Right Cure. Watch my latest 2-minute video where I discuss how this scientifically unsound claim that Type 2 diabetes is caused by insulin resistance can continue after 80 years. 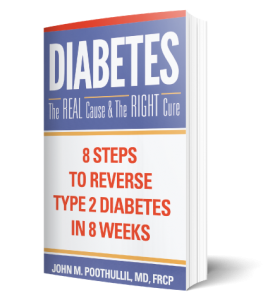 My informative yet easy to use book will guide you or a loved one to reverse Type 2 Diabetes in 8 weeks. My plan will also help you to remain diabetes free as you will take this on as a lifestyle. Make better choices and take ownership of your health today! Download the eBook for only 99 cents! Then tell a friend! !